Often we don’t write minutes, because it takes so much time. 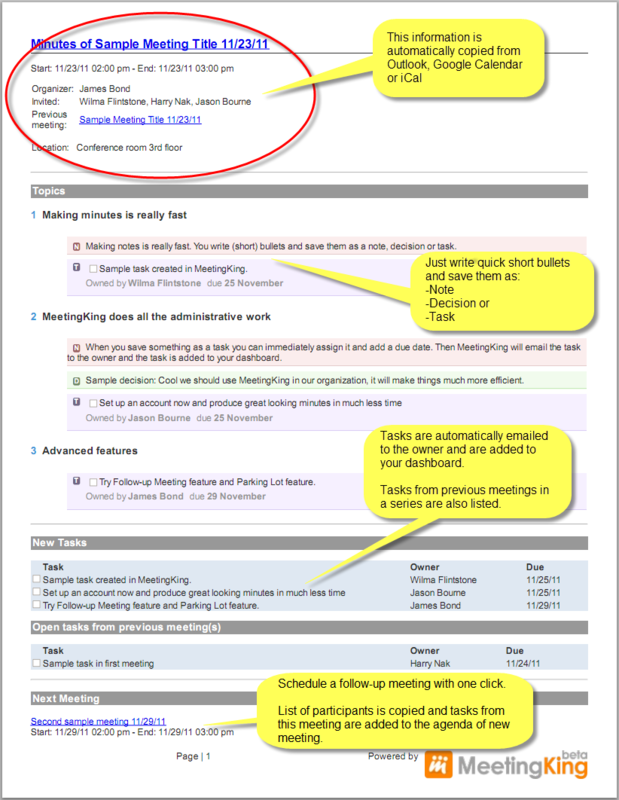 MeetingKing makes its fast and easy. Recipients will be impressed with the documents you create. Obviously if you have an improvised meeting and no agenda you can simply add topics and subtopics as you go. Since your meeting worksheet already has the title, list of participants, date, time, location and the list of topics there is no need anymore to write that down. And when you are ready with your notes (usually immediately after the meeting), you can print and email professionally formatted meeting minutes with one click. No need to create a new email message, add all recipients and attach a Word document, in MeetingKing everything is done directly from the application. MeetingKing is your assistant, but you will get the credit!